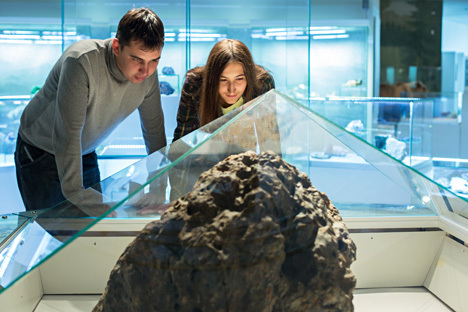 In February 2013 the fragments of a meteorite made landfall in Chelyabinsk Region in Russia. It is the largest known celestial body to fall to the ground after the Tunguska meteorite in 1908. RIR spoke to leading Russian scientists to find out what they have learned about the Chelyabinsk meteorite over the past two years. The Chelyabinsk meteorite flew to the Earth from the side of the Sun, Vladimir Surdin, a researcher at the State Astronomical Institute of the Sternberg, told RIR. A long journey through the atmosphere caused quite delicate meteorite matter to break up into small pieces. Most of these pieces burned up before reaching the Earth's surface. Originally the meteorite weighed about 13 tons, but only about six tons of meteoritic material or 0.05 percent of its mass fell to Earth. To date, scientists have collected no more than one ton of meteoritic material. Chondrites get their name because of the large number of chondrules that they contain (chondrules are rapidly solidified drops of silicate material – RIR). This means that the Chelyabinsk meteorite had never been a part of any planet, but was made up of 4.5 billion year old matter that formed the planets of our solar system.